The HIKE Fund Inc. is a non-profit charity incorporated under the laws of the state of Nebraska and registered with the Internal Revenue Service as a tax-exempt charity. It is administered by a Board of Directors composed of individuals in the fields of audiology, business, education, labor, law, and medicine. The HIKE Fund Inc. has awarded many types of devices for the hearing impaired including Hearing Aids, FM Systems, Closed Caption Converters, Tactile Units, Alerting Systems, and Specialized Sports Equipment. 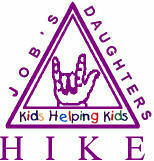 Job’s Daughters International official charity is The HIKE Fund, Inc. (The Hearing Improvement Kids Endowment Fund). The purpose of HIKE is to provide hearing devices for children with hearing impairments between the ages of newborn and twenty years whose parents are unable to meet this special need financially. Each year at least 100 children have been provided hearing devices. Through HIKE, Job’s Daughters International has embraced the needs of hearing-impaired children. The HIKE Fund, Inc. has provided children with hearing assistive devices since 1986. If you know of a child who needs a hearing assistive device and is financially unable to obtain assistance, please contact us by emailing: johnhauser11@gmail.com.